Not so much an April fools as a spring time gift! 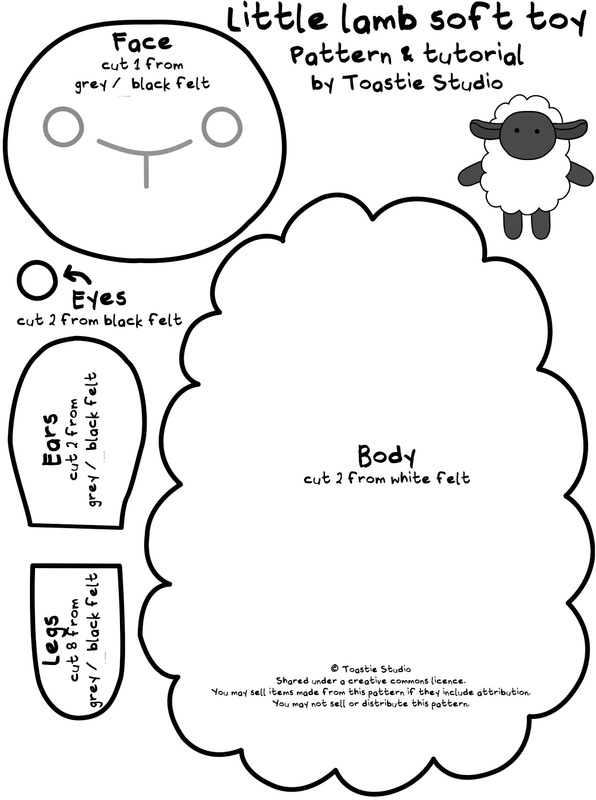 Here is a cute little spring lamb soft toy, make it in time for Easter gifts or just because he is sooooo cute!! First, print off the pattern and cut all the pieces out of your felt. We are going to start by sewing the face and ears onto one of the white pieces of felt. Take one of the ears and fold one edge in half and pin in place (I find paper clips very handy). Repeat for the other ear, and then pin them behind the face piece of felt. Start sewing around the edge of the face, securing the ears in place. Before you get all the way around add a little stuffing to give the sheep a nice plump face. Now we are going to sew the eyes and nose detail on. Use the pattern to help you sew on the detail. By doing it now and not before you make a really nice face with plump cheeks etc. Now take all 8 leg pieces and sew them together to make 4 sets of legs. Add a little bit of stuffing inside each leg. Lay your legs down on top of the back white felt piece and pin in place. Lay the front body piece on top and pin that in place too. 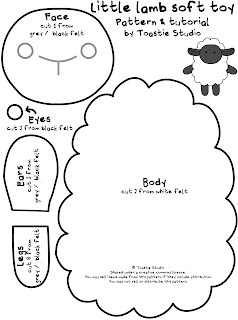 Start sewing around the sheep body. When you have nearly sewn all the way around start stuffing your little lamb. Thank you for reading this tutorial, I hope you can make lots of happy little lambs to run around the garden! If you maybe don’t have time to make one but just have to have one, then the little lamb above is for sale in my Etsy shop. The money raised from his sale will be going towards “De Heij” kinderboerderij in Rotterdam to get some potbelly pigs! 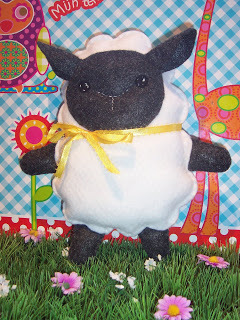 This entry was posted in Tutorials on March 18, 2011 by Handmade Cuddles. How cute! I’ll be featuring this tomorrow.